RUGBY LEAGUE: DEVILS fans at Jack Stokes hoping for a decisive victory to end the 2017 season this afternoon would have been bitterly disappointed, with visitors Bribie Island taking out the game 34-24. The fact it came after last week's hard-fought victory over Pomona will only add salt to the wound. The frustration could be clearly seen on the faces of Gympie players from the sidelines, with Bribie's nimble and devastating attack proving too much for defensive lines. Special mention has to be made of visitors Luke Gillett and Danny Dean, the former being responsible for three of Bribie's trys while Mr Dean was a constant presence on field - and could be seen in the fray for most of the game. Not that the Devils were taking this lightly however, with dazzling breakaway moments often hamstrung by fumbles. Josh Greaves provided a critical try for the home side, followed by a beautiful conversion by Jake Harney. Taking the time to collect themselves, Gympie came back in a big way for the second half - leaving it all on the field, working hard to recover. 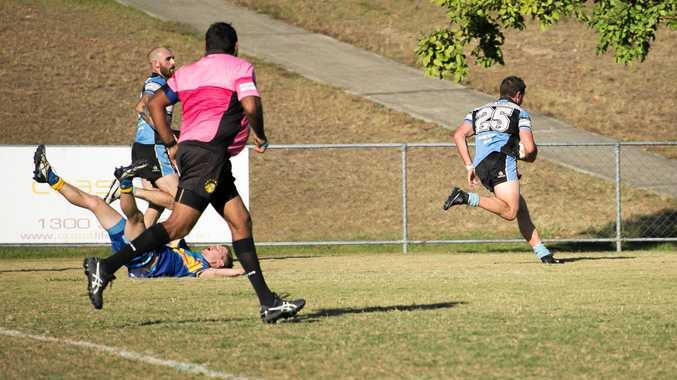 Jack Stokes Oval roared with approval when Jacob Houghton broke free from an attempted tackle, sprinting halfway down the field to deliver one of the finest tries of the game. The clock running down did little to dull the Devils' fire either, with Josh Greaves again making a last ditch attempt to get points on board, with most of Bribie Island in hot pursuit. It made for a photo finish, and a much-needed spark to end another year for the team.